The popularity of online anonymity networks in Iraq has exploded in recent weeks as the flustered government has cracked down on Internet communication, pushing over 10,000 people into previously unexplored corners of the Web at any given moment. Tor is perhaps the best-known software that’s used around the world by activists, criminals and hackers who want to avoid the gaze of government monitors and targeted advertising. Formerly an acronym for “The Onion Router” (a name inspired by the onion’s many layers), Tor is made up of a network of volunteers who redirect an individual’s Internet signal so many times that it becomes nearly impossible to track the originator's location. The project is accessible with a range of browser plug-ins and also gives users access to the array of hidden criminal websites known as the Deep Web. But Tor isn't just a vehicle for criminality. Countless users around the world now rely on Tor for everyday access to the Internet. In part because of the ongoing revelations about National Security Agency surveillance and because of increased censorship in Turkey, Egypt, Russia and China, the software has been downloaded 120 million times in the past year alone, according to the Daily Dot. Iraqis have become the latest group to seek out the service after the Ministry of Communication ordered Internet Service Providers (ISPs) to block news and social media websites (including Facebook, Twitter, YouTube, WhatsApp, Instagram and others) while shuttering the Web entirely in some areas. Prime Minister Nouri al-Maliki’s administration has maintained that the blockade is an attempt to stop ongoing propaganda efforts by the Islamist State of Syria and Iraq (ISIS), but the government has been unable to convince the ISPs in ISIS-controlled areas to do much of anything. There’s more evidence that the administration has sought to clamp down on public discourse related to the sectarian violence than it has on ISIS’ Twitter activity, according to a report from the University of Toronto’s Citizen Lab. Researchers examined sites affiliated with ISIS and found that they weren’t blocked, whereas 20 different social media outlets were targeted by Doman Name Server (DNS) interruptions, a method used by governments in the past. “This is a ludicrous excuse for collateral censorship for a government that claims to be democratic, especially after the death of hundreds of thousands of people required to reach this state of government and remove the previous dictatorship that denied Iraqis their basic freedoms,” Mustafa Al-Bassam, a former member of the blackhat hacking collective LulzSec, told the Daily Dot. A Tor transparency report indicates that since 2011 there hasn’t been a single day when more than 3,000 users browsed the network at once, although most days during that period had no more than a few hundred people. That changed over a six-day span that began on June 11, when more than 15,000 users accessed the software before dipping to 13,000 and rising again on June 24. If numbers released by the Firechat instant-messaging app are any indication, much of the new demand for Tor was created by the new difficulty in simply communicating on social media. Christophe Daligault, an executive with OpenGarden, which makes Firechat, said the number of downloads has been a surprise. Metrics from other countries with restrictive governments have similarly fluctuated with the political climate. Tor subscriptions in Russia, for example, floated around 25,000 until a vast, vaguely written anti-piracy law went into effect in August 2013. 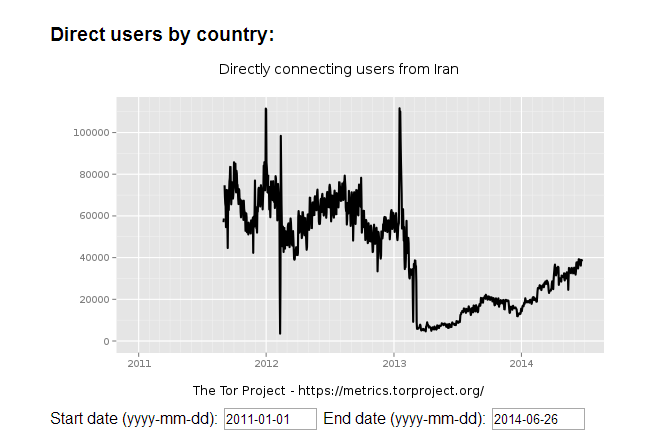 The use of anonymity networks in Iran was at its lowest during the final months of Mahmoud Ahmadinejad’s presidency. 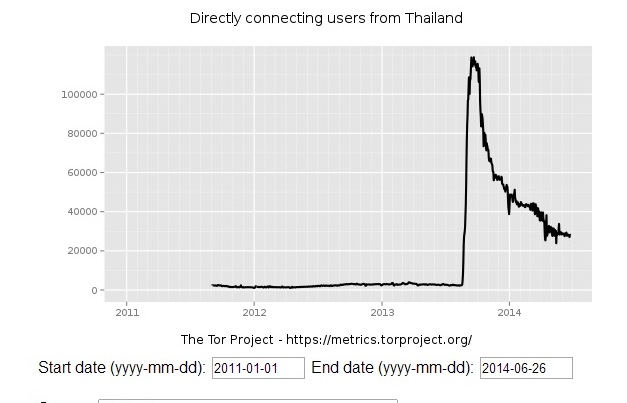 Looking at the use of Tor in Thailand, it’s pretty easy to determine when current unrest began. 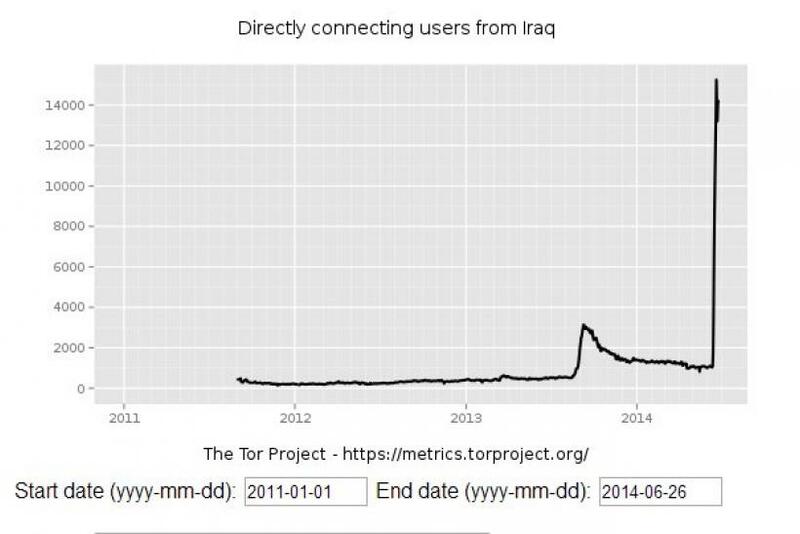 It’s possible that Tor is being used not only by frustrated Iraqis but also by the very ISIS fighters the Maliki government has tried to suppress. Anticipating such a strategy, the government blocked Tor’s homepage, though activists quickly created a large list of mirror sites accessible in still-connected regions of the country that makes Tor easy to communicate online without impediment. The mirror pages were accompanied by instructions in both English and Arabic. Runa Sandvik, a contributor to the Tor Project, told Wired that the ongoing events in the Middle East are just one reason that the various anonymity networks are necessary in the information age, which has given rise to corporate warehousing of online conversation and new threats to citizens who could be at risk if they express themselves honestly.